How to dodge “salties” and stingers and still have fun in Oz. Our Cairns guide with sights, sounds, smells and the best of Cairns hotels and budget backpacker stays. SYDNEY HARBOUR may be synonymous with Australia but a trip up north is a true blue Aussie experience – with the country’s deadliest critters thrown in completely free. For many years, this tropical backwater’s claim to fame has been that of gateway to The Reef. Yet Queensland’s tropical north is actually home to not one but a trio of Australia's natural icons – the Great Barrier Reef, tropical rainforest and the Outback. That this city’s northern beaches are some of the cleanest on the continent hasn’t done its growing popularity any harm either. If you flout the warnings and arrive smack in the heat of summer (January), you’ll be greeted by marine stinger season (October to May). Beaches will be off limits to swimmers. That is, unless you’re happy to risk the severe muscular pain, vomiting, burning skin and soaring blood pressure that contact with box jellyfish or “irukandji” would bring. In some cases, your heart stops beating, which can totally ruin a holiday. Eventually the marine stingers leave Queensland’s waters but the discovery of a “saltie” (saltwater crocodile) patrolling off a popular swimming beach brings the No-Swimming signs back up again. These are just the first things to learn before planning your Cairns holiday with screaming family in tow. So on to our Cairns guide. To pre-empt the stingers and crocs, and compensate for the Cairns city mangrove rather than sandy waterfront, a 4,000sq m swimming lagoon was built along the city esplanade. Beach towels and fiery red bodies now line every available stretch of turf. This free public pool has become the city’s focal point – the place to gawk and be gawked at. A three-kilometre-long boardwalk also runs along the mangrove-lined esplanade, dotted with picnic benches and barbecues, free to use for a kangaroo steak and sundowner. A weekend focal point is Rusty’s Market (www.rustysmarkets.com.au, open all day Friday and 6am-2pm Sat and Sun), a 30-year institution, selling fruit, vegetables, exotic flowers and food. If it’s local colour and culture you’re after this is the best place to see Cairns at play. Casual observations suggest that despite Cairns’ natural beauty, the city centre attractions tend to leave a manmade aftertaste. However, a manmade impression is hard to avoid in a wild and inhospitable landscape – so don your plastic blinkers and enjoy the chance to traverse mountain, beach, reef and rainforest, minus the risk of certain death. The Kuranda Scenic Railway (tel: [61-7] 4036 933, www.kurandascenicrailway.com.au, one-way A$40 adults, $20 children under 14) traverses 15 hand-excavated tunnels and 33km of dense, mountainous tropical rainforest before ending up at the fern-decked railway station of Kuranda. A hippy enclave in the 1960s, Kuranda has since blossomed into a fine tourist trap. The hill resort offers a welcome respite from the blistering heat of the coast complete with soothing retail therapy in the form of the Kuranda Market. Here you can pick up really handy items like didgeridoos (aboriginal wind instruments), cowrie shells, stuffed koalas, and T-shirts. Amphibious vehicle “duck” rides through the rainforest are available at the nearby Kuranda Rainforest Station. Kangaroos, koalas and crocodiles are well represented in the park. Lessons on how to throw boomerangs and hurl spears are taught by aboriginal Australians and should add a whole new dynamic to interactions with friends and colleagues back home. The highlight of the Kuranda excursion is saying goodbye. Because that means a cable-car ride over the mountains. The Skyrail Rainforest Cableway (tel: [61-7] 4038-1555, www.skyrail.com.au, one way A$40 adults, $20 children) is a 7.5km cable car ride from Kuranda to Smithfield (which lies 10km north of Cairns), making it the world’s longest gondola cableway, with views of the rainforest canopy and Coral Sea. Speaking of which, the Great Barrier Reef is not to be forgotten in your Cairns vacation. In winter months the bright coral and colourful fish can be masked by murky waters that send the fish swimming to pastures cleaner. For those who have seen the Great Barrier Reef in all its glory, there is no comparison and no complaining, so pick your time of year carefully. Over 1,000 islands can be found off Australia's coast along the Great Barrier Reef. Many offer accommodation, which can range from camping grounds to luxury bungalows. Closest to Cairns is Green Island, a 12-hectare coral bay that houses a resort and an underwater observatory. 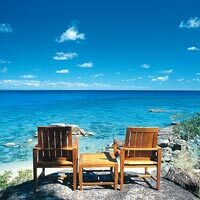 Also popular with day-trippers is Fitzroy Island, a mountainous rainforest oasis surrounded by fringing reef formations. Three hours south of Cairns (a short jaunt in this vast land), off the coast of Mission Beach, lies Dunk Island, which is a national park, and Magnetic Island, named by Captain Cook after the island’s natural magnetic field sent his compass spinning. Also close by, Hinchinbrook Island is Australia’s largest island national park. North of Cairns, Lizard Island, some 80 kilometres north of Cooktown, offers magnificent beaches and excellent deep-sea fishing. Cairns’ cultural attractions often come as a surprise. The region’s colourful past offers plenty to tempt culture and history buffs. The Tjapukai Aboriginal Cultural Park (tel: [61-7] 404- 9900, www.tjapukai.com.au) offers five theatres, a museum, an art gallery and a traditional Aboriginal camp. A Taoist temple built by Chinese pioneers in the early 1900s has also been refurbished and reopened. The Hou Wang Chinese Temple (tel: [61-7] 4091-6945, www.houwang.org.au), located in the Atherton Tablelands, was built to serve the spiritual needs of Chinese immigrants drawn to North Queensland by the prospects of striking gold along the banks of the Palm River. An onsite museum offers insights into the struggles and legacies of these early immigrants. 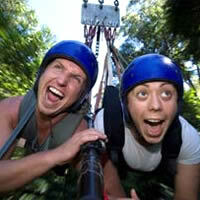 Crashing out of the quiet city centre is a wave of adrenalin sports to scare, soak and stupefy any unsuspecting tourist. Indeed no family holiday in Australia – or a Cairns guide worth its salt – would be anywhere near complete without an adventure ride of some kind. Adventure tour operator Raging Thunder (tel: [61-7] 4051-1500, www.ragingthunder.com.au) can arrange All Terrain Vehicle (ATV) rides, hot-air ballooning, and white-water rafting. AJ Hackett’s (tel: [61-7] 4057-7188, www.ajhackett.com.au) 50-metre bungy jump or “Minjin swing” is a sure fire way to inject some speed – or heart attack – into your vacation. Sign on the dotted line and you can explore the 16 ways of jumping, including off the third level (read: roof) on a BMX… Don’t say we didn’t warn you. Come away from the experience with photographs and a DVD – necessary proof for friends and relatives of your moment of madness. An insider tip for all adventure sports fans are standby rates. You can save yourself up to A$150 on the more expensive activities (scuba diving and skydiving), if you are prepared to go on standby for a cancellation. In terms of proximity to facilities and the scope of tour offerings, Cairns is perfect for family holidays, with few destinations offering more to do per square mile. Cairns International Airport is a 10-minute drive from the city. 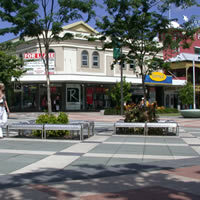 The Cairns city centre itself is quaint, laidback and small enough to cover in half a day. Here you'll find the usual suspects – dive shops, travel agents, restaurants, pubs, cafes, souvenir shops and department stores. Three hours north of Cairns, the rainforest meets the reef. Cape Tribulation, or Cape Trib as the locals know it, is where these two UNESCO World Heritage regions exist side by side. 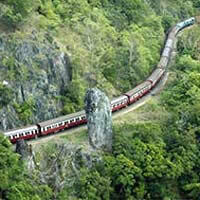 And this makes the quaint village a nature lover’s paradise of walks, treks, dives, and river cruises. The beach resort of Port Douglas lies 80km north of Cairns and boasts six kilometres of pristine palm-lined beach. Decidedly upmarket, Hollywood celebrities and ex-US presidents have reportedly paid large sums of money for their own piece of Port Douglas paradise. Lying an hour-and-a-half southwest of Cairns and easily the prettiest town on the Tablelands, historic Yungaburra is a great place to escape the summer heat of the coast. 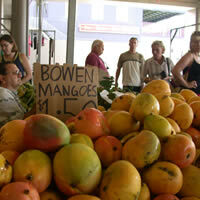 It is an excellent base for the exploration of the Atherton Tablelands and the Lakes District. In days gone by the Cairns portfolio was a smattering of backpacker hostels and guesthouses where dorm beds were the order of the day. Cairns still attracts the east coast surfer set, but now plays host to eco-lodges, five star internationals and luxury retreats all clamouring for a slice of rainforest, beach and mountain action. There are a number of bed-down options whether you’re on a backpacker budget or willing to throw some serious cash around. 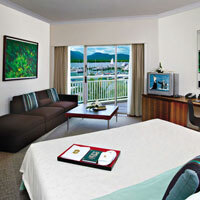 Good value family friendly hotels in Cairns are never a problem. Some familiar hotel brands are stationed within a five-minute radius of the CBD, with all boasting a ten minute drive from Cairns International Airport, a short walk to the Cairns Convention Centre, and shorter stroll to the Esplanade Lagoon, pier shopping, dining promenade and the Great Barrier Reef Fleet Departure Terminal. Renovated five-star Shangri-La Hotel, The Marina, (formerly Radisson Plaza at the Pier) is a Cairns stalwart, sat regally at one end of the esplanade with stellar views over Marlin Marina and Trinity Bay. The 255 rooms are modern with smart, clean lines and neutral colours. In a 32sq m room and 49sq m suite you can expect a safe, tea and coffee facilities, free Wi-fi and Broadband access, TV, Sony PlayStation, separate bath and shower, and a balcony – essential for a taste of outdoor Aussie living. Another property claiming a sea view is five-star The Sebel Cairns Hotel (formerly Cairns International Hotel). Taking full advantage of the vista, rooms start on the ninth floor and there are private balconies for all. Rooms are larger than average at 40sq m. Décor has an emphasis on comfort not often seen in Cairns’ typically Spartan room offerings. Mii Spa is a city version of Sebel’s first Palm Cove resort spa and offers a large range of massages and therapies. Spa out or just pig out at Coco’s Sunday buffet brunch with all you can drink mango daiquiris. Next door the Hilton Cairns Hotel’s unfussy rooms start from 30sq m and have Internet access and a Sony PlayStation. At the corner of Esplanade and Florence Street is the Holiday Inn with a rainforest of its own rising up into the atrium lobby. All 237 rooms feel large and airy with floor-to-ceiling windows, some leading onto a balcony. Moving in from the waterfront, the 74-room, ten-suite All Seasons Cairns is set in an all-white building two blocks from the Esplanade. All rooms include free WiFi, tea and coffee-making facilities, iron and board, hair dryer and Jacuzzi bathtub. Make a big splash in the pool rather than your wallet at this mid-range Cairns hotel. Other mid-range options in the city centre include the Mantra Esplanade and The Mercure Hotel Harbourside Cairns. A happy medium in budget and style is the Floriana Guest House. This 10-room, family run guesthouse may put a strain on serious backpacker budgets but could slice a hotel rate in half. With top marks for location and a heritage fix should you need one, Floriana sits in the middle of the Cairns Esplanade in a 1930s art deco building. Rooms are charmingly kooky with a happy-go-lucky mixture of art deco, bright colour and floral fabrics. Front rooms have a sea view and there’s a garden with pool, barbecue area and lots of outdoor seating. Sociable backpackers on a budget may be well served by the sizeable Gilligan’s Backpackers with its 1,000-capacity beer hall and large pool. Another cheap choice is the 33-room Great Northern Hotel sans pool but with a buffet breakfast. Reef Palms with reasonably-priced apartments and a pool is within walking distance from the city centre. Nomads Serpent Resort is also centrally located and claims the biggest pool ever seen in a backpacker hostel. North of Cairns it’s about a 25-minute drive to Palm Cove, another 20 to Port Douglas and Daintree is further north still. Our Cairns guide also ventures south to Mission Beach and the islands off its coast. In line with the appeal of these destinations that are a bit farther afield, boutique hotels and eco-lodges offer a little more luxury, spa services, activities ranging from bird watching and diving to yoga, and plenty of character. Just outside of Cairns, Kewarra Beach Resort is a plush bungalow resort set between rainforest and beach. Like most resorts and lodges in this environment you can assuage your luxury needs and green conscience – that’s two birds with one fluffy tickle stick. Choose your bungalow or suite accommodation by habitat: beachfront, lagoon or rainforest. Inroom expect a clean white space with wooden floorboards, LCD TV, video-on-demand, free WiFi, tea and coffee facilities, safe, minibar, and iron and ironing board. Bathrooms are spacious with hairdryers and environmentally-sensitive toiletries, and all rooms have a private verandah. Farther north, the small, 69-room and suite Sebel Reef House and Spa, Palm Cove offers a secluded space in shady gardens with three pools, including a waterfall, to retreat to when the stingers are out in force. Brigadier rooms are elegantly furnished, drawing on colonial style with white shuttered windows and beds draped in netting – a romantic protection against seasonal mosquitoes. Enjoy just as much private outdoor space as there is indoors, or stroll to the swimming beach opposite. Perched on a rocky outcrop, 16km south of Port Douglas, Thala Beach Lodge takes you even further away from any vestige of civilization. There are no cars, precious few signs and even fewer people to disturb picture perfect views and a private beach. Timber bungalows, sat high on stilts in the forest canopy, have beach or rainforest mountain views and simple, comfortable décor. All have verandahs from which you can spot birds, butterflies, and at night, possums and sugar gliders. Not one for nature-phobes, but if you can swing with the birds, bees and large spiders, then Thala Beach Lodge is great for those serious about their seclusion. Daintree, in-between Port Douglas and Cape Tribulation, is home to the boutique 15-villa Daintree Eco Lodge & Spa. The rustic rainforest villas on stilts or on a forest lagoon house you in luxury, well protected from the wilds outside. A fully micro-screened balcony keeps unwanted critters away from the original Aboriginal art, TV and CD player, mini-bar, tea and coffee facilities and WiFi Internet. Spa treatments like Ngujakura (meaning Dreamtime) focus on indigenous traditions. Julaymba Restaurant & Gallery serves up an impressive mix of kangaroo fillet, fresh barramundi fish and local artworks. 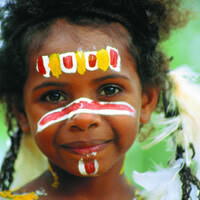 It’s a child friendly Cairns resort with an educative flavour to boot. The eco-sensitive Green Island Resort is located on, well, Green Island. It has 46 suites, each with a balcony overlooking the pool or rainforest. With scenery this spectacular who needs a plush room product? Rooms are large but furniture and décor is a little old fashioned considering the steep rates. 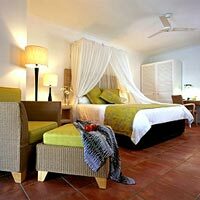 Décor is slowly improving with the arrival of LCD TVs and smarter bed linen in some rooms and the rate does include a lot of island and reef activities. Guests also have the option of dining in the restaurant, or for a romantic touch, on the beach as the sun sets. Lizard Island is a quick plane ride from Cairns. The 40 villas at the exclusive Voyages Lizard Island all have grand views. There’s an emphasis on diving and scuba diving, but don’t book the family holiday just yet – children under 12 years are “not catered for”. More child-friendly is Voyages Dunk Island, which has a Kids’ Club and roomy split-level units overlooking the sea, as well as a nine-hole golf course and spa. Dunk Island is a 45-minute plane ride or a two-and-a-half hour boat trip from the mainland. There’s a small pick of Great Barrier Reef resorts for picky romantics, and families. Stylish The Elandra, South Mission Beach, is a 55-room hotel with a high-end polish. Rooms are linked by an elevated timber walkway through the rainforest. Inside, walls and linen are white, while furniture and textiles have an attractive African and Middle Eastern flavour. Think minimalist bohemian chic. Each room is uniquely styled with an outdoor terrace or balcony, 32” LCD TV, mini bar, tea and coffee facilities, hairdryer, iron and board, and King suites have a free standing bath. Elandra may be white, blindingly so, but you can soothe your eyes by gazing at the lovely pool from a poolside lounger or double bed. Set in Nelly Bay, within ten acres of tropical gardens and manicured lawns, All Seasons Magnetic Island is a new addition to the island off of Mission Beach. All 75 rooms have a private verandah, sitting area, kitchenette, TVs and a spacious bathroom. If athletic, look to the tennis courts, pool or newly renovated gym for entertainment, while kids can enjoy a playground and games room. So what are you waiting for? Print out this Cairns guide and sprint off. Getting around Cairns is a doddle. In fact, if you’re reasonably fit and alarmingly poor (like some of us scribes), a bicycle is an easy and cost-efficient way to soak in the sights and sounds. Just be careful when soaking in the deceptively inviting waters off those picture-postcard beaches. They bite. Tropical North Queensland is pleasantly cool in winter (June), warm in September, and hot and humid in December. The Aussie dollar won’t get you as much bang for buck as a trip to South East Asia, but recent years has seen as many as three to the US dollar. The current exchange rate is US$1= A$1.8, so watch the pennies and the stock exchange. While you can stroll around the city centre, getting out of town is best done by car or rental bicycle. Choice Car Rentals (www.choicecarrentals.com.au) has compact cars from A$45 per day. Cairns Rent A Car (www.cairnsrentacar.com) has a minimum five-day hire with a wide choice of cars. At Cairns Bicycle & Scooter Hire (www.cairnsbicyclehire.com.au) you can rent hourly or daily from A$35 for scooters and A$9 for bicycles. A family-size Toyota or Hyundai comes in at around A$60 per day, less if you rent for longer. Black and White Taxis can be dialled at 131-008, (www.blackandwhitetaxis.com.au). For reef trips and adventure travel try: Great Adventures Reef & Green Island Cruises (tel: [61-7] 4044-9944, central_ga@quicksilvergroup.com.au, www.greatadventures.com.au, reef tour rates from A$178 adults, $89 children below 15) or Ocean Spirit Cruises (tel: [61-7] 4031-2920, reservations@oceanspirit.com.au, www.oceanspirit.com.au). Visitor information is available at the North Queensland Visitor Information Centre, 51 The Esplanade, (tel: [61-07] 4051-3588, info@tropicalaustralia.com.au, www.tropicalaustralia.com.au). All Seasons Cairns. Tel: [61-7] 4051-5733, fax: 4031-2298, (e-mail: info@allseasonscairns.com.au or www.all-seasons-hotels.com). Hilton Hotel Cairns. Tel: [61-7] 4050-2000, fax: 4050-2001, (e-mail: info_cairns@hilton.com or www.cairns.hilton.com). Holiday Inn. 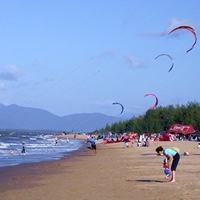 Tel: [61-7] 4050-6070, fax: 4031-3770, (e-mail: admin@holidayinncairns.com.au or www.ichotelsgroup.com). Mantra Esplanade Cairns. Tel: [61-7] 4046-4141, fax: 4046-4242, (e-mail: esplanade.res@mantraresorts.com.au or www.mantraesplanadecairns.com.au). The Mercure Hotel Harbourside Cairns. Tel: [61-7] 4051-8999, fax: 4051-0317, (e-mail: reservations@mercure-harbourside.com.au or www.mercure-harbourside.com.au). Shangri-La Hotel, The Marina, Cairns. Tel: [61-7] 4031-1411, fax: 4031-3226, (e-mail: slmc@shangri-la.com or www.shangri-la.com). Sofitel Reef Casino Hotel. Tel: [61-7] 4030-8888, (e-mail: res@reefcasino.com.au or www.sofitel.com). The Hotel Cairns. Tel: [61-7] 4051-6188, fax: 4031-1806, (e-mail: reservations@thehotelcairns.com or www.thehotelcairns.com). Daintree Eco Lodge & Spa. Tel: [61-7] 4098-6100, (e-mail: info@daintree-ecolodge.com.au or www.daintree-ecolodge.com.au). Hibiscus Gardens Spa Resort. Tel: [61-7] 4099-5315, (e-mail: info@hibiscusportdouglas.com.au or www.hibiscusportdouglas.com.au). Il Palazzo Boutique Hotel. Tel: [61-7] 4041-2155, (e-mail: info@ilpalazzo.com.au or www.ilpalazzo.com.au). Kewarra Beach Resort. Tel: [61-7] 4058-4000, fax: 4057-7525, (e-mail: reservations@kewarrabeachresort.com.au or www.kewarra.com). Thala Beach Lodge. Tel: [61-7] 4098-5700, (e-mail: reservations@thalabeach.com.au or www.thala.com). The Elandra, Mission Beach. Tel: [61-7] 4068-8154, fax: 4068-8596, (e-mail: info@elandraresorts.com or www.elandraresorts.com). The Sebel Reef House & Spa. Tel: [61-7] 4055-3633, fax: 4055-3305, (e-mail: reservations@tsrhpc.mirvac.com or www.reefhouse.com.au). 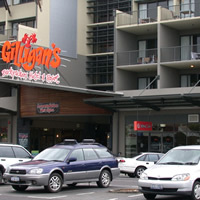 Gilligans Backpackers Hotel & Resort. Tel: [61-7] 4041-6566, fax: 4041-6577, (e-mail: reservations@gilligansbackpackers.com.au or www.gilligansbackpackers.com.au). Great Northern Hotel. Tel: [61-7] 4051-5151. Reef Palms Motel. Tel: [61-7] 4051-2599, (e-mail: info@reefpalms.com.au or www.reefpalms.com.au). Nomads Serpent Resort. Tel: [61-7] 4040-7777, fax: 4031-8401, (e-mail: res@serpenthostel.com or www.serpenthostel.com). All Seasons Magnetic Island. Tel: [61-7] 4778-5200, fax: 4778-5806, (e-mail: reservations@magneticresort.com or www.magneticresort.com or www.accor.com.au). Green Island Resort. Tel: [61-7] 4031-3300, (e-mail: res@greenislandresort.com.au or www.greenislandresort.com.au). Voyages Lizard Island Resort. Tel: [61-2] 8296-8010, (e-mail: travel@voyages.com.au or www.lizardisland.com.au). Voyages Dunk Island Resort. Tel: [61-2] 9364-8900, (e-mail: travel@voyages.com.au or www.dunk-island.com). Kuranda Rainforest Village. Tel: [61-7] 4093-9311, (e-mail: info@kuranda.org or www.kuranda.org). Kuranda Rainforest Station, Kennedy Highway, Kuranda. Tel: [61-7] 4085-5008, fax: 4085-5016, (www.rainforest.com.au). Cairns Tropical Zoo, along Captain Cook Highway just before Palm Cove. Tel: [61-7] 4055-3669, fax: 4059-1160, (e-mail: info@cairnstropicalzoo.com or www.cairnstropicalzoo.com.au). Hartleys Crocodile Adventures, along Captain Cook Highway, 15 minutes north of Palm Cove. Tel: [61-7] 4055-3576, www.crocodileadventures.com).